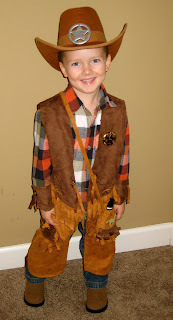 Raising Jack With Celiac : A Cowboy, Candy Corn Cookies and a Bowl Full of Candy! A Cowboy, Candy Corn Cookies and a Bowl Full of Candy! For their special treat at school today, Jack needed a sugar cookie in shape of a candy corn. So we whipped up Pamela's Products sugar cookie recipe using her White Cake Mix (she now has a Sugar Cookie Mix) and they turned out fabulous! We made a few adjustments to the recipe, but I was happy with the texture and taste and so was Jack! Besides the fabulous cookies, we are ready for a great night of trick or treating with our friends and neighbors and have a bowl FULL of gluten-free candies to share! This also gives Jack a chance to trade any of his gluten candies he may get, like Whoppers, Twix, KitKats, Crunch, etc. from trick or treating. We are excited for the evening to come and I look forward to hearing all about Jack's day at school. Let the sugar high begin! Wishing you all a safe and fun Halloween! Nice looking blog! Glad I ran across it. On Halloween evening my celiac daughter and I sorted her candy into two piles. Then we weighed the non-gluten free candy I agreed to let her pick out the same amount of gluten free candy in the store the next day. It was really fun for her to have free-reign to pick out whatever gf candy she wanted.